Cathy gave a wry smile. She could relate to the woman’s regret. Our readers of Bloodlines-Traces might well recognize the regret of not haven spoken to their grandparents and other family members while they still had a chance. Truth, the real life story, can at times be stranger than fiction. While researching his family history, Scotsman Tom McKerley, co-author of the Bloodlines series, found out he was actually of Irish descend. 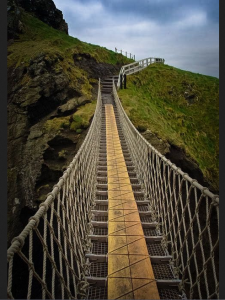 He even went to visit and walk on the famous carrack-a-rede rope bridge of county Antrim, close to where his ancestors were from. This, as a result of finding a picture, depicting his father and two men unknown to Tom, standing on that very same suspension bridge. ‘I can only wonder if this was a coincidence or if my father knew Ireland was the home of our ancestors. He was a young man there, I wasn’t even born yet’ Tom recounts. ‘I researched my father; my fathers father and his father.’ he continues. When I went looking for them, I found my great great great grandfather, John McKerley on a census in 1850 on which he was listed as Irish. His wife was Sarah Gibson by the way,’ Tom adds with a wink, Sarah Gibson being a character in both Bloodlines – Touch Not the Cat and Bloodlines-Traces. ‘John was from Londonderry and Sarah from Colraine. They married in County Antrim 1839. I found them in 1850 (in a manner of speaking), on the census. At that time they had one 2 year old son, a wee boy called Robert. It is very unlikely that after 11 years of marriage that would have been their first child. The census locates them in a little town called Broughshane. I reckon that is where John found work. From childhood onward, co-author Ingrid Schippers, was told the family rumor of great grand mother Schippers (née Spui), being an illegitimate child from Prins Hendrik, the rather illustrious spouse of Dutch Queen Wilhelmina, great grandparent to the present day Dutch king. Further research however revealed an even more astounding scenario. This becomes all the more interesting when the Schippers family member who researched all this, discovered Huiberdina worked at the Royal Palace as a maid for King Willem II. Willem II was known for his taste for lovers, both men and women. His biographies describe his habit to keep servants at the palace to serve his more intimate needs. There is also mention of his having to pay large sums of money to silence some of his illegitimate escorts. 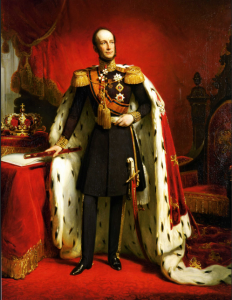 ‘So….even though I do not ever expect to find records stating my great great greatgrandmother was given maintenance fees by King William II, there is a fair possibility Huibert Schippers was one of his illegitimate children’, Ingrid concludes.